A spin workout is an excellent way to burn calories and relieve stress, spinning utilizes a stationary bike with multiple tension levels. The Elite Cyclone Spin Bike will track your progress and keep you motivated to carry on to accomplish your fitness goals. 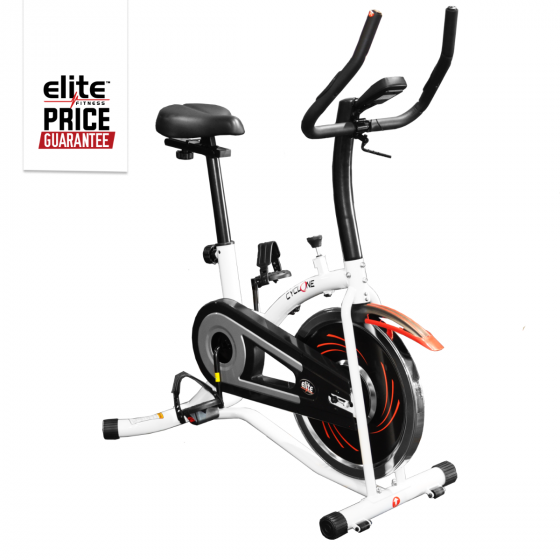 The Elite Cyclone Spin Bike is designed and engineered to deliver thousands of indoor miles in the comfort and safety of your own home. A great way to ensure you’re getting the exercise you need all year long no matter the weather, the Elite Cyclone Spin Bike spins smooth and adjusts to fit you perfectly. With built-in toe cages on the Elite Cyclone, you will engage more muscles as they power through each rotation, and the bonus of helping your feet stay firmly in place means you can reach your full potential. When you are finished, the simple-to-move frame gives you the ability to store the Cyclone it out of the way, with a pair of built-in dual front rollers. Offering multiple hand grip positions along with fore, aft and dual height adjustment, the Elite Cyclone Spin Bike delivers the kind of custom comfort that will keep you rolling mile after mile. Smooth Quiet Chain Drive System: To deliver a smooth, quiet and comfortable ride. Limitless Tension Control Dial: Increase resistance easily with a turn of a dial, you can accurately increase or decrease intensity to suit your personal goals, whether you hill climbing or speed training, increase your heart rate easily to burn more body fat. Transportation wheels: Easily move the Elite Cyclone around the house with the need to lift with its portable transport wheels.